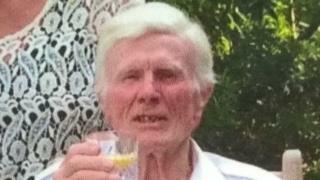 An 82-year-old man died when he had a heart attack and fell into the River Thames, an inquest has heard. Frederick Lawson went missing after going to check his boat in Shiplake, near Henley-on-Thames, Oxfordshire, on 4 April. Divers searched for days before heavy rain and high waters forced them to stop. His body was found on 20 April. Coroner Darren Salter at Oxford Coroner's Court concluded the death was an accident. The inquest heard how at 08:45 BST Mr Lawson went to make sure his boat was well secured after receiving a flood warning from the Environment Agency. It was moored at the rear of the garden of his house on Mill Lane. In a statement read out at the inquest, Mr Lawson's wife Beryl said: "I went to tell him that breakfast was ready. "When I got there he was nowhere to be seen. I called the police 25 minutes after he had left the house." The retired university lecturer's body was discovered 16 days later by a boatyard operative at a nearby marina. Consultant pathologist Dr Sanjiv Manek said: "In my opinion it was likely to have been a cardiac arrest, leading to him falling in the water and drowning." Mr Salter said the extent to which drowning was the cause of death was "debatable". In summing up he said Mr Lawson had "suffered a cardiac arrest, causing him to fall into the water".